Etching Plate Plastic Small 120x190mm May be used instead of metal plates- Clear plastic allows quick transferral of image. Etching Plate Plastic Large 250x380mm May be used instead of metal plates Clear plastic allows quick transferral of image. Etching Plate Sheet 1000mm x 610mm x 0.75mm - Heavyweight Crystal clear acetate sheet - can be easily cut to size as etching plates. Lino Tiles - Grey Silk Cut - $8.69 - 300x300mm Highest quality - Silk cut linoleum is made from 6 ingredients - linseed oil, rosin, wood flour, limestone and cork, which are mixed, then pressed on to a backing of natural jute and then allowed to cure- Note that the size has reverted to the traditional 300 x 300mm. Silk Cut Lino Tiles -300mm x 300mm Box of 50 - $374.00 - Silk cut linoleum is made from 6 ingredients - linseed oil, rosin, wood flour, limestone and cork, which are mixed, pressed on to a backing of natural jute and then allowed to cure. Note that the size has reverted to the traditional. Lino Carving Tool Sakura Large U - Individual replacement tool. Lino Carving Tool Sakura Medium V - Individual replacement tool. 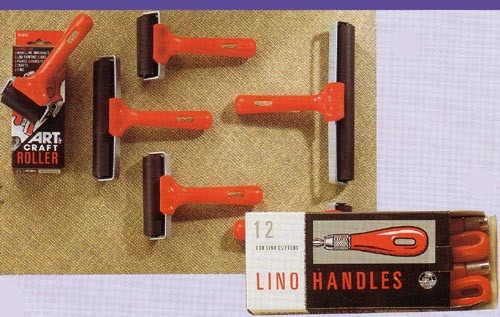 Lino Carving Set - NAM Wallet 6 Set of 6 lino carving tools. Blades made from manganese steel, having a high resistance to bending or breaking. Lino Tool Small V #1- High carbon steel blade with timber handle- Can be resharpened. Lino Tool Large V #2- High carbon steel blade with timber handle- Can be resharpened.